You might be wondering, investing in the stock market is risky and you could potentially lose all of your money. That is true, no arguments here, it is easy to blow your money on lousy investments if you are not careful. I want to briefly explain why Lottery tickets are for suckers. The first question is; of all the money you have invested in lottery tickets over the years, how far ahead are you financially as a result? I’m guessing you have spent more money on lottery tickets than you have won. Therefore, financially you are losing that game. Perhaps it is time to find a new financial game to play. Currently I am not invested in any shares on Wall street, however, eventually once I have paid off all my debt, I will once again be reinvesting. There are many styles of investing, when it comes to Wall Street investing, I only stick with the simplistic long term dividend investing style. I have never worked or invested as a day trader, nor do I recommend it. I do not recommend shorting shares either. I will only be looking at this from a long term dividend investor perspective. First of all, I was invested in five major companies on the New York Stock Exchange; McDonalds (MCD), Philip Morris International (PM), Altria (MO – Philip Morris USA), Coke-a-Cola (KO) and General Electric (GE). Each of these companies paid dividends every 3 months without fail, even during the global financial crisis. The way it works, for every share you own, you receive a dividend payment. In the US the payments are made every 3 months. The more shares you own, the more dividend payments you receive. Each company will pay a different amount for each dividend and some companies do not pay dividends at all. My investments were focused only on companies that paid reliable dividends on a regular basis. There are plenty to choose from. Not only that, provided business continued to go well, these companies all tended to increase their dividend payments each year by quite a large percentage. There were some cases where dividend payments increased by 100% or 50%. It was common to have a 15-20% increase in dividend payments from one year to the next for a company. Imagine if you accumulated enough dividend payments from multiple companies to use as your income. How many jobs out there claim to offer 15-20% increases in pay each year? None that I am aware of. Not to mention, the tax rate of dividends in the US is 15%, last time I checked. The tax rate is much lower than that of a regular income from a paid job. When your receiving dividend payments, you are receiving an income from a company your invested in, not necessarily working for. It took a while to get used to, but I liked being paid by companies I did not work for. Don’t get me wrong, when I first started investing, the amount I received was not enough to live off. Initially I was receiving approximately $35 of dividend payments every 3 months from these companies combined when I first started. Every paycheck I received from my job at the time, I invested 50% of it into more shares. It eventually reached a point where my entire investment portfolio was earning me approximately $1 per hour; 24 hours a day, 7 days a week. The payments from all of these companies were made every 3 months, which then went into buying more shares. Dividend payments from one company, do not have to reinvested in the same company. You can use those dividends to buy shares in a completely different company, it is up to you. Using dividend payments to further buy more shares is known as compound interest. That is interest earning you further interest, which then earns you further interest again and again. That is the real power of long term dividend investing. The more time you have, the more you earn through compound interest. Time is an important part of the investment equation using this style of investing, it is NOT a get rich quick scheme like the lottery. If you have read this short article and have a basic understanding of how dividend investing works, do you really think lottery tickets are still worth it? They are not, Lottery tickets are for suckers. The Lottery tickets are for suckers meme was created as a quick way to try and sum up why your better off buying shares in a dividend paying company than buying lottery tickets. Hopefully this article has motivated you enough to look further into investing instead of buying lottery tickets. However I must point out, the US stock market is currently in a huge bubble and do not recommend buying any shares at the moment (November 2018). I would recommend you wait until the bubble bursts before buying any stocks. In the mean time while you wait for the stock market bubble to burst and you want to learn more about dividend investing, there are a lot of great resources to choose from. I would recommend starting with Jim Cramer. It is where I started, by watching Mad Money on CNBC then went on to read Jim Cramer’s books. Mad Money is available through iTunes as an audio podcast at no cost. Well worth listening to, as he has a lot of valuable knowledge and experience about Wall Street and investing. Jim Cramer makes investing interesting. Remember, you need to do your research (homework) on companies before you invest. Never buy and forget, stay on top of your research, even after you buy shares in companies. You don’t want to invest in the next Toys R Us or Sears without staying informed about their current status. You need to protect your investments, after all, it’s your money invested. 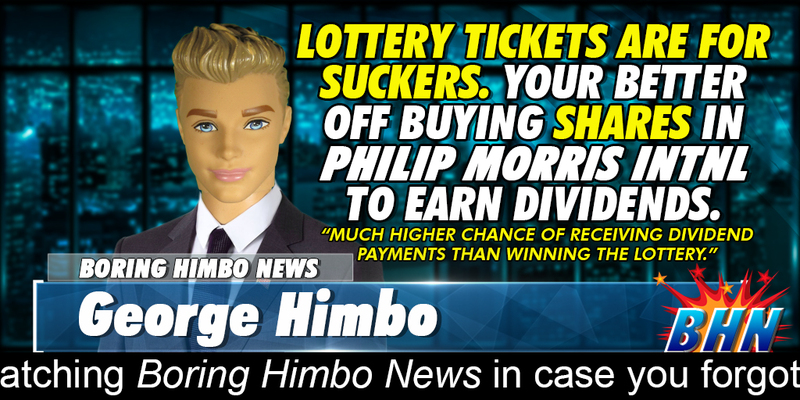 Now you can see how Lottery tickets are for suckers.